More and more states and nations are starting to require e-waste recycling. Electronics are full of heavy metals that potentially can contaminate water and soil. Landfills aren't able to deal with them. So now computers, televisions, cell phones, game systems, mp3 players, and other electronics are becoming obsolete at ever faster rate; yet we realize that they contain valuable and contaminating metals. The magnitude of the electronic waste problem is that experts estimate that an average American family has 24 pieces of electronics. The average life of a computer is about 3 years and that of a television is even shorter. That volume of e-waste, as it is called, will be disposed of because it no longer works, has been replaced by something better, or becomes a problem because the manufacturer no longer supports it. Some heavy metals used in electronics pose potential environmental risks. A computer monitor may well contain a couple of pounds of lead. Mercury in small amounts is found in flat panel computer monitors and laptop screens. And cadmium is found in batteries of some older laptops. That's a serious matter. Equally significant, it's wasteful not to recycle when certain components of an item can be salvaged. For example, your old cell phone may contain copper, gold, tin, brass, zinc, and other surprising things. The plastic case can be recycled. So don't just push it to the back of a drawer, thinking you'll reclaim it later. Should Your Community Begin an E-Waste Recycling Program? For communities, this is an important topic. After all, electronics represent about 2 percent of all solid waste, most of which is headed to a sanitary landfill. Less than 20 percent of U.S. electronics are recycled. And of that amount, as much as three-quarters might be sent outside the U.S., where recyclers may or may not operate on the basis of environmentally sound standards. 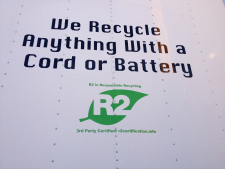 The more green communities may be prodded by residents to begin electronics recycling. However, before you start an e-waste recycling program, investigate the sheer number and ambition of programs sponsored by manufacturers and major retailers. That’s when you can call it to the attention of your citizens that many computer companies will take back their old computers. Also there are take-back programs free or at a modest cost for cell phones, televisions, laptops, digital cameras and camcorders, printers, scanners, projectors, binoculars, game systems, rechargeable batteries, and mp3 players. Many of the e-waste recycling initiatives of individual corporations only handle that company's old item, but some will take products from any manufacturer. Many major retail chains offer free drop-off at their stores. At least where we live, Best Buy stores are a great no-hassle option; simply tote your dead or obsolete computer to the customer service desk and drop it off. At numerous U.S. post offices, you can mail back items such as iPods free; check it out. Related items, such as printer cartridges, also can be recycled; many times a mailer for returning the depleted cartridges is included with your purchase of a new toner. For corporate e-waste recycling projects, see this electronics recycling program site. To find a local place to recycle electronics without the hassle of special mailers, here's an e-waste recycling locator gadget. Secondly, remember that re-use and waste reduction are always more environmentally sustainable than recycling. Invest a little effort in discovering local programs that pass old computers and televisions on to other users who would be glad to have slightly outdated equipment. Domestic violence programs often accept cell phone donations. Large corporations have been donating their outdated computers to schools for a number of years, but think more creatively. Point out to your citizens that it may be possible to sell operable items through an on-line auction also. Suggest to your residents that it's really not all that difficult to scrub your computer hard drive, to delete phone numbers and remove the SIM card from their cell phones, and to make sure that cameras and camcorders no longer have any photos in memory. A little on-line research provides quick and current information on how to do all of this. If your community takes all of this into account, and you still decide you want to add e-waste recycling to a municipal recycling effort, just make certain that your a commercial vendor acts responsibly and doesn't simply strip out the most valuable components and dispose of the rest carelessly. Ask the e-waste recycling vendor to explain the certifications they have earned. Something called the BAN Pledge of True Stewardship is the gold standard for this. If you get a blank stare when you ask about certifications, you might be just a step above a smart high school kid working in the garage. The argument for local electronics recycling is that, just like any form of recycling, the participation rate is higher when it is convenient. So weigh the factors before you decide. I'd try publicity about the many other avenues available for reuse and recycling first, but if publicity doesn't reduce the volume of electronics in your local waste stream, it's time to try a mandatory program.